More people are into mountain biking now. It is even considered better than road biking. Not to mention there are many locations of MTB tracks available. If you are visiting Banten Province there is Pinang Mountain MTB Track. There are no cars and hassles. Visitors can simply come with their mountain bike and enjoy a splendid adventure there. Are you interested? It is good for your health and you can enjoy the serene of nature. On top of that, it costs nothing! 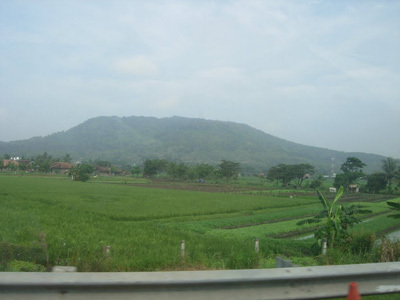 Pinang Mountain is a famous tourist spot in Banten Province. One of the best features is the mountain bike track. Everyone is allowed to access this location, in fact. Just like typical mountains, it is surrounded by shady trees and numerous types of landscapes. The nuance is relaxing as there are no vehicles and pollution. The best time to visit the mountain is in the morning. It is when the atmosphere is cool and the sun isn’t quite hot. Make sure not to come in the afternoon as it can be a little bit dark. The mountain bike park is situated in Wanayasa Village. It belongs to Kramatwatu District and Serang Regency, actually. The locals consider it as the best spot for mountain biking. Not to mention they have created a Volcano MTB Community. This is a popular club in Cilegon. If you live nearby, you can join it and make some friends. Also, it becomes an opportunity to learn more about mountain biking. Even beginners can join it. The instructor and the leader may share knowledge and experience with the members, after all. Another name of mountain biking is downhill biking. The community comes to Pinang Mountain every weekend. Thus, it is better to come in such time. The MTB track has the length of 2.2 km. Most of the features are the downhill and they come in different angles. There is even a downhill with 50 degrees angle. Dare you to explore it? Before visiting this location, it is better to learn the schedule. Somehow, it is also important to know a little bit about the history of MTB Community. It is said such community has been there since 2005. It got more members over time. Most of the members are mountain biking and nature lovers. Some of them even come from other provinces. For beginners, such activity can be dangerous. The community helps rookies to perform downhill biking in a safe manner. This becomes a reason to join the club, so you should never overlook it. There is an instructor and he may tell you about the safety standards. In a nutshell, mountain biking includes safety gears like goggle, helmet, and body protectors. Once you fulfill such requirements, you are ready to go. A trip to Cilegon City takes about 2-3 hours. The distance is 96 km from Jakarta to Pinang Mountain. You can use Pantura Street and later turn to Tangerang-Merak Freeway. From there, your last destination will be Pinang Mountain.